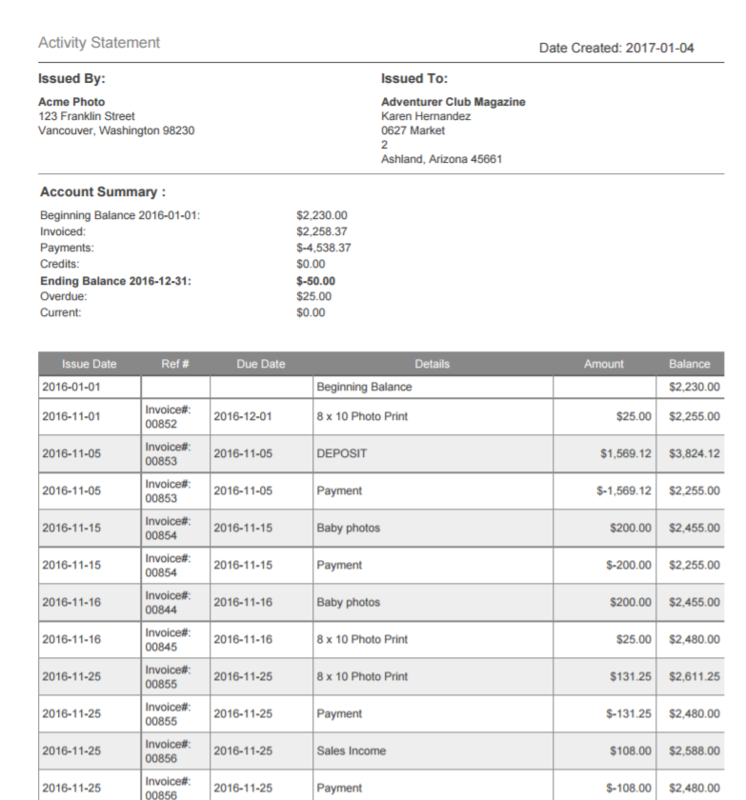 Activity Statement: Shows a record of all activity (invoices, expenses, credits, and payments) between two dates. 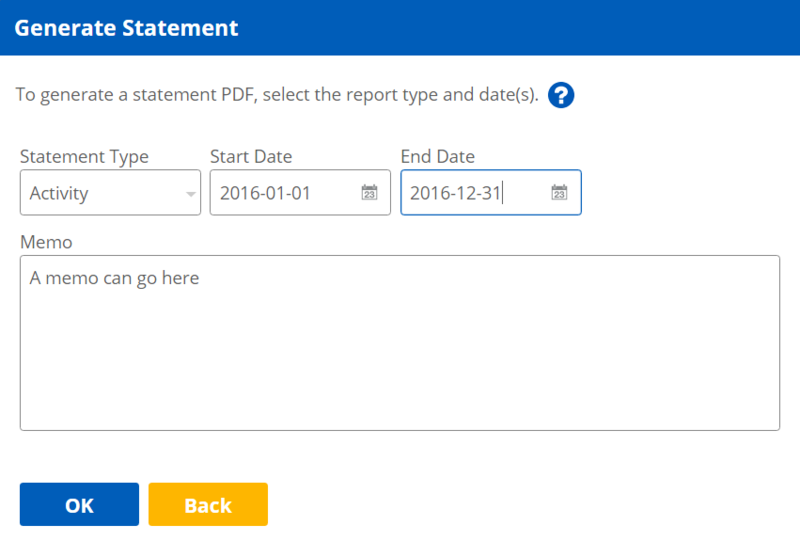 Summary Statement: Shows a summary of outstanding invoices/expenses as of a certain date. 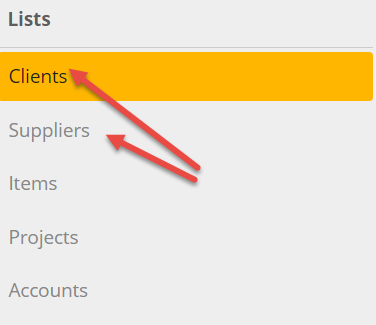 To generate a Statement for a contact, either go to the Client or Supplier pages. Scroll down to find the Statement button and click on it. You will be given a choice to choose between an Activity Statement or a Summary Statement. If you would like an Activity Statement that shows a record of all activity, then choose Activity for Statement Type and then a Start Date and an End Date. 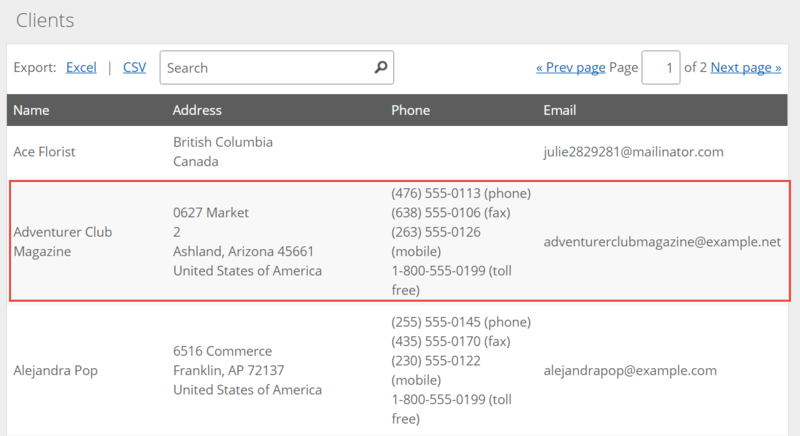 A typical date range is one month, but you can enter whatever dates you like. You can add a Memo if you like, which will display at the bottom of the Statement. 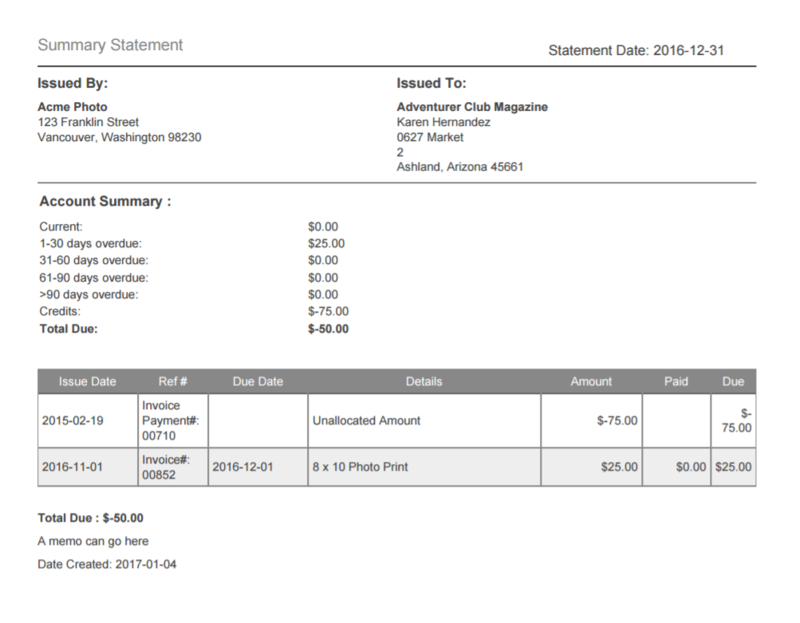 Press OK to generate a PDF of the Statement. Beginning Balance: This is the balance of all outstanding invoices/expenses minus credits as of the Start Date. Invoiced: This is the total value of all invoices/expenses issued between the Start Date and End Date. Payments: This is the total value of all payments made between the Start Date and End Date. Credits: This is the total value of all credits issued between the Start Date and End Date. Ending Balance: This is the balance of all outstanding invoices/expenses minus payments and credits as of the End Date. Overdue: This is the total value of all invoices/expenses that are currently overdue as of the End Date. Current: This is the total value of all invoices/expenses that have been issued but are not yet due as of the End Date. A note about credits: When a credit is applied to an invoice/expense, you'll notice that there will be no dollar amount shown. This is because the balance (which equals outstanding invoices/expenses - credits) already factors in credits, so applying a credit won't change it. If you would like a Summary Statement that only shows outstanding invoices as of a certain date, then choose Summary for Statement Type and then an As Of date. You can add a Memo if you like, which will display at the bottom of the Statement. Press OK to generate a PDF of the Statement. Please note that Statements will not be generated for contacts that have transactions which are considered to be invalid. For example, if an invoice is created against the Accounts Payable account, or an expense is created against the Accounts Receivable account, this will be deemed invalid and hence the transaction will not appear on a Statement. How exactly does this happen? 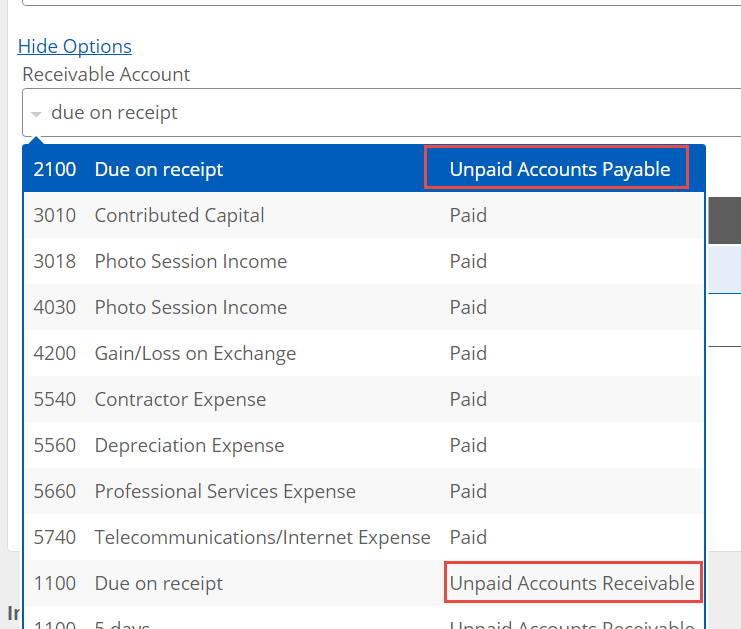 Well, if you're creating an invoice and choose a Payable account instead of a receivable account, as seen below. If you'd like these transactions to appear in the Customer Statement, you will need to update the Receivable account with the right type of unpaid account (in the example above, a customer invoice should use a Unpaid Accounts Receivable account).